After you have decided on what topic that you are going to write about, the next step is writing an outline. Some authors use this approach each and every time they start writing their novels. It is a good way to get an insight into how your book will flow. In college I took English 101 where the main thing we did was write essays. Each essay had to have an introductory paragraph with a thesis sentence, at least three paragraphs that explain your thesis, and a conclusion. You can look at that and get an idea of how you what to set up an outline. Your introductory paragraph should have a thesis or first sentence that grabs your reader’s attention. It should give the reader some clue what the book will be about. Once you have a thesis sentence and your topic, write an outline about things you might want to talk about in the story. Brainstorm for at least five minutes writing down things that might interest the reader. Come up with at least your main character. You don’t have to have all the character names and qualities decided, but it helps to have at least your main character developed in your mind. If your topic is about medicine, history, education, sports you might not need a character to tell the story. 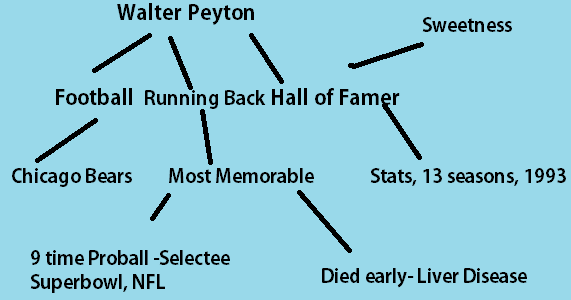 Thesis: Walter Peyton was the greatest running back of the century, leading the Chicago Bears to the Superbowl. “Sweetness” as some known him was one of the best players for the Chicago Bears during his thirteen seasons. He is one of the most memorable running backs of all time. His stats of most yards gained, touchdowns, yards for carry, and his endurance earned him his ‘Hall of Fame’ award in 1993.